Today I have 2 things you need to focus on for longer drives. But before I give you those two things I need to comment on something. In one of the replies I got recently about “golfers problems” a golfer said they couldn’t gain distance even though they tried just about every driver on the market. They’re at the limits of what they’re allowed to do as far as technology and the rules are concerned. So the only way a golfer is going to hit the ball further with one driver over another is if the impact perimeters are better. You can most certainly get fit for a new driver to help you do this. But if you buy off the shelf then it will be a lottery whether you hit the ball further due to better impact perimeters. Anyway, that leads into one of the most important impact perimeters, which is where you strike the ball on the clubface. See, it doesn’t matter what driver you’ve got… if you miss the middle of the clubface then you’ll lose yards. So one of the two focuses you need is to work on is consistently hitting the middle of the clubface. In this program I outline a number of cool ways of working on and improving this. But one of the easiest is to simply put some impact tape on your golf club. Also, try a shorter driver. There’s a reason why guys on tour use 43 and 44 inch drivers. 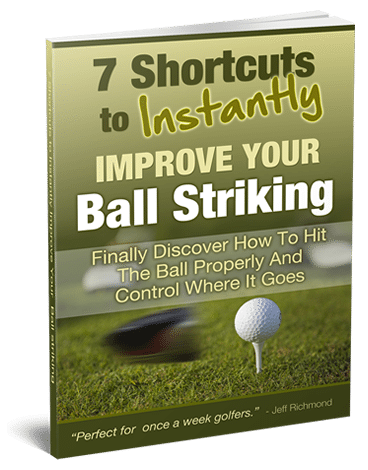 It’s to hit the ball straighter and hit the center of the clubface more often. The second main area you need to focus on to hit the ball longer is to increase your swing speed. If one person averages 80 mph and another person averages 100 mph then the second person is ALWAYS going to be the longer hitter. 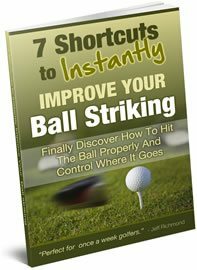 This program is the best for helping you to increase your swing speed. Whether you get that or not, just don’t do something like Yoga and expect to hit the ball much further. You may in the beginning just because you’re becoming more flexible, but long term you won’t. The reason for that is because the golf swing is a fast movement. If you want to swing faster you need to train to swing faster. Doing static stretching, like Yoga, is never going to help you swing your fastest. Recently Tiger Woods has been talking about doing explosive training to get his power back. That’s what you need to do if you’re going to swing faster. Although you do need a good strength base first. Go here to check out a program to help you do that. Ok, so here’s the two things that will give you the best return on investment in helping you to hit the ball further. 1. Hitting the center of the clubface more consistently.